There is something for everyone in the beloved Piazza Navona situated in the center of Old Rome. One of the largest piazzas in city, visitors and Romans alike gravitate to Piazza Navona to dine or wine. ItalyPerfect loves to stay in the historic, central neighborhood around Piazza Navona. It is convenient to many great attractions, restaurants and cafes. Italy Perfect presents, Viva, an apartment that is perfectly located for enjoying this part of Rome. It is located on a street that parallels the length of Piazza Navona, so close to the action but not the noise. Tastefully furnished like a luxury hotel suite, it is a one-bedroom apartment with a full kitchen, living room, beautiful bathrooms and it opens onto a private terrace. A marvelous retreat right in the wonderful Piazza Navona neighborhood. Take the Viva photo tour! While meandering the Piazza Navona we suggest you find a spot on one of the benches that line the piazza and appreciate the theater of tourists, Romans, artists and buskers. 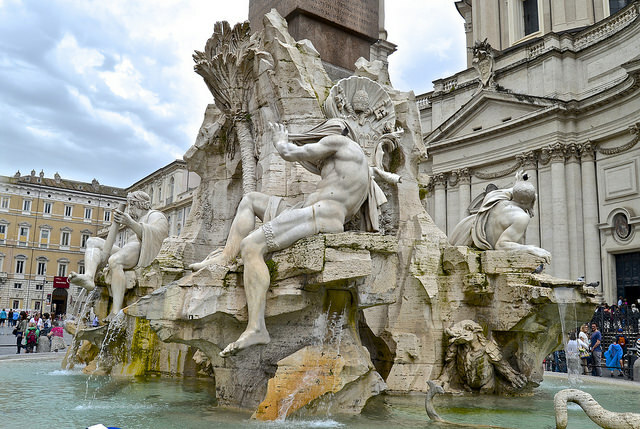 Within its graceful oval, determined by the Roman amphitheater that once stood here, stand three lovely fountains, the central being Four Rivers Fountain by Bernini with its dramatic figures. There are amazing restaurants on the piazza, like famous Tre Scalini that also sells, even for take-away, the decadent Tartuffo (truffle) chocolate gelato concoction and many more. On a parallel street Da Baffetto pizzeria has a cult following. There are several fine gelaterias on the north side of the piazza and parallel Via del Governo vecchio, just look for the queues. There are restaurants of every kind, such as Cul de Sac that has one of the most extensive collections of wine we have ever seen. One note is that there are some pretty mediocre restaurants sprinkled among the fine ones, so look at reviews or, if you are an Italy Perfect guest, our list of favorite restaurants. If you are staying in the area, you will surely find Il Fornaio bakery with treats of every kind and a fine cappuccino. Palazzo Braschi is a museum that houses masterpieces, many of scenes of Rome and has a pleasant sculpture-filled arcade with a café. Family trip (all ages) is in December and I want your list of favorite restaurants that you mentioned in this newsletter.